Physical Form Colourless, non-flammable liquid; ethereal odour or chloro. Solubility Soluble in about 10,000 volume water; misc with alcohol, ether chloroform, benzene. Basis	-	1 ton perchloroethylene and 850 Kg. chlorine. Perchloroethylene is manufactured by the pyrolysis of Carbontetrachloride. Vaporize Carbontetrachloride and pass into a furnace containing electrically heated carbon shapes at 800-900Â°C, which decomposes into hexachloroethane and perchloroe-thylene with a simultaneous release of chlorine. Pass reaction products into a steam jacketed column at 80-85Â°C. Unreacted Carbontetrachloride and chlorine pass overhead to condenser and recycle. Hexachloroethylene and perchloroethylene condenses and collect at the bottom of column; separate both the products in a still-perchloroethylene goes overhead. Separate hexachloroethylene crystalls from bottoms, and recycle through the furnace to increase the yield. Mix chlorine, propane and recycle streams and feed to a chlorination furnace at 900 to 1200Â°F chlorination of hydrocarbon producing Carbontetrachloride and perchloroethylene. 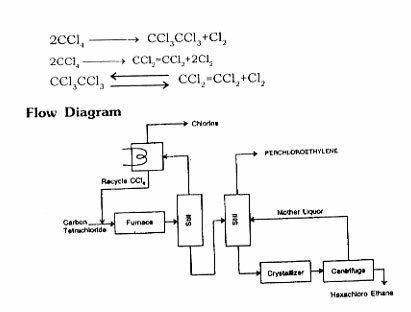 Purify the crude perchloroethylene by distillation. Dry cleaning; degreasing metals; solvent. Moderately toxic to human by inhalation with the following effects:- local anesthetic, canjunctiva irritation, general anesthesia, hallucinations, distorted perceptions, coma and pulmonary changes. An eye and severe skin irritant. Physical Form White crystalline solid. Resembles ethyl acetoacetate in chemical reactivity. Toxicological Data LD-50 Oral 6.5 g/kg. Solubility Slightly soluble in water, soluble in dilute sodium hydroxide, alcohol, ether, acids, chloroform and hot benzene. Xylene (as solvent) 500 Kg. 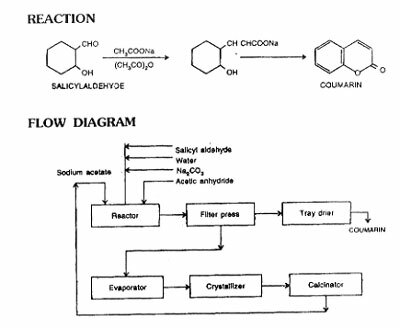 Take aniline and acetoacetic ester in reactor in presence of xylene and triethanolamine. Heat to boiling. Aniline reacts with acetoacetic ester at that temperature in liquid phase. Distill the alcohol produced by the condensation. Distill the alcohol and xylene with a refulx ratio of 3-4 : 1, without taking ester. Crystallise the acetoacetanilide, filter, dry the product. (1) Process Test Determine the completion of removal of alcohol. (2) By product 250 Kg. Alcohol. It is used in organic synthesis, dyes e.g. acid yellow 99, and acid yellow 44. It is an intermediate fpe hansa- }iellow and benzidine yellow pigment. It is used in rubber compouding. Poison by intraperitoneal route. A weak allergen when hated to decomposition it emits toxic NOx fumes. Fire fighting : To fight fire, use alcohol foam, water mist, CO2 dry chemical. Physical Form Yellow crystal, Slender monoclinic prisms by sublimation in vacuo. Solubility Insoluble in water, very slightly soluble in ether. Soluble in alcohol. Sulphuric acid (98%) 4600 Kgs. Charge phthalic anhydride, benzene, and aluminium chloride in a moler proportions 1:1.2 into a reactor which is essentially a horizontal ball mill containing iron balls or rods. 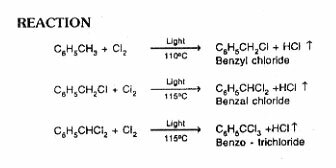 Carry out the reaction at 40 to 50Â°C, charge swells and formation of aluminium chloride complex of benzoyl-benzoic acid take place. Scrubb liberated hydrogen chloride in a scrubbing system. At the end of reaction drop the dry powder of the reactor into a tank containing chilled dilute sulphuric acid. The aluminium chloride complex decomposes and o-benzoyl-benzoic acid precipitates. Filter the precipitated acid, wash and dry. The yield based on phthalic anhydride is 96 to 98%. Dissolve the dried o-benzoyl-benzoic acid (1 part) in 98% sulphuric acid (4 parts) in a jacketed vessel and heat the charge for 1 to 3 hr at 140 to 150Â°C. Discharge the mass into a tank of boiling water at the end of reaction. Cool the slurry, filter. Physical Form White to yellowish-white crystals; slightly phenolic odour. Darkens with age or exposure to light. Flash Point 307Â°F closed cup. Solubility Slightly soluble in water; more soluble in boiling water, glycerol, olive oil. Solutions of alkali hydroxides. Very soluble in alcohol, ether, soluble in chloroform. 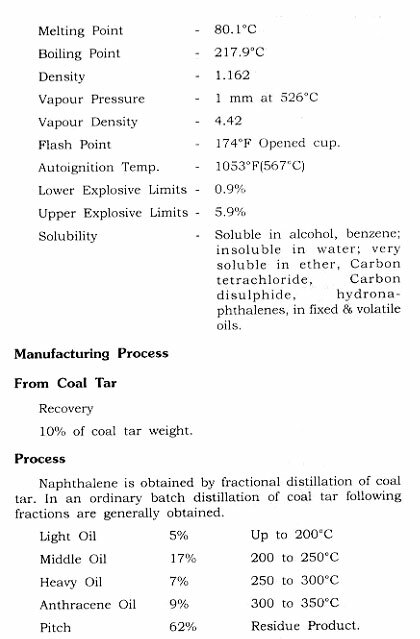 b-naphthol is manufactured by the alkalifusion of sodium naphthalene-p-sulphonate, which is obtained by neutralizing the sulphonation product of naphthalene. Sulphuric acid (66Â°Be) 1450 Kg. Charge naphthalene to sulphonation kettle and melt by heating to 90Â°C. Add sulphuric acid to melt with rapid agitation. Heat the mass to 160"C-165Â°C and maintain this temp, for several hours, during which time water and naphthalene distill off. Keep the condenser at 90Â°C and recover the condensed naphthalene, dry and reuse. At the end of reaction the product will be around 85% naphthalene-(3-sulphonic acid and 15% alpha isomer. 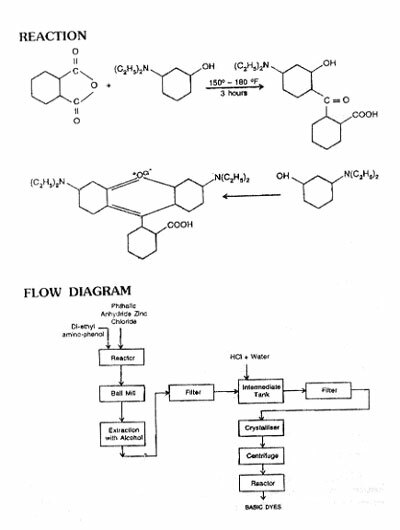 Hydrolyse the alpha isomer by blowing. Physical Form Very pale yellow crystals. Solubility Practically insoluble in cold water, slightly soluble in hot water, soluble in alkaline solutions. BON Acid is manufactured by heating sodium-2-naphtholate with carbon dioxide under pressure and precipitating with sulphuric acid. Basis 1 ton BON Acid. The process consists mainly three steps. 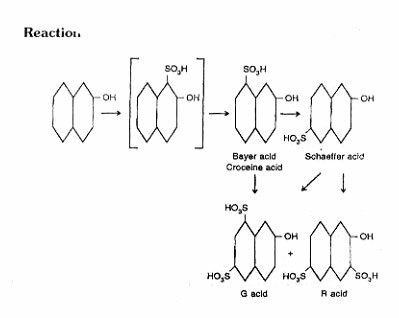 Preparation of BON acid with sulphuric acid. Fuse p-naphthol with caustic lye at about ISGTCTifi an autoclave, carry out dehydration. After completion of dehydration, carry out carboxylation in a ball mill by introducing CO2 gas under pressure (4-5 atm) and there is formation of sodium naphthyl carbonate. Filter the solution, separate BON acid and crude P-naphthol, feed P-naphthol into the distillation unit and recover purified P-naphthol. Decolourise the BON acid with activated carbon, filter the solution and precipate BON acid with sulphuric acid. Filter the precipite, dry and pack the product. The water-soluble sodium salt has been used to solubilize riboflavin. 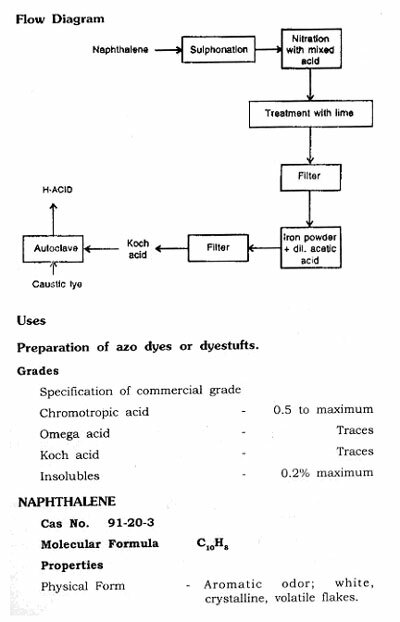 In manufacturing of azoic dyes and pigments. Naphthols from B.O.N. 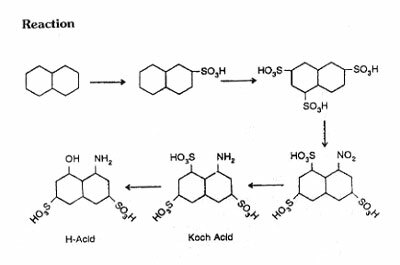 acid have great superiority over p-naphthol as coupling agent, the azoic dyes derived from them being faster to washing. It is also used as pharmaceutical intermediate. 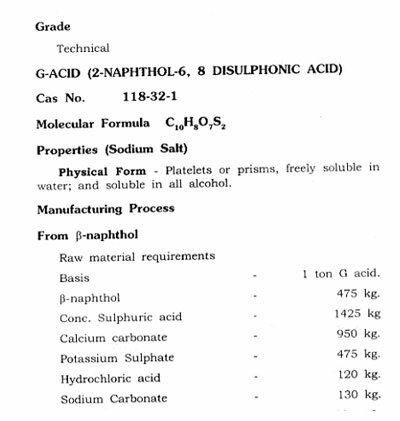 G acid is formed by the reaction of sulphuric acid on b-naphthol. 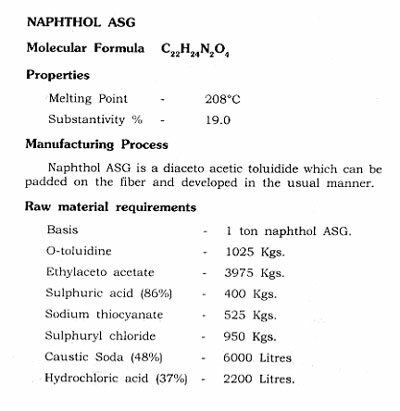 Add fine powder p-naphthol to concentrated sulphuric acid at a temp of 30Â°C under stirring. Maintain the solution for 24 hrs at 30Â°C for completion of sulphonation. At 30-35Â°C, G acid predominates and at 60Â°C R acid is the principal product. Pour the mixture into water, remove the excess amount of acid by chalk, which also form calcium sulphate. 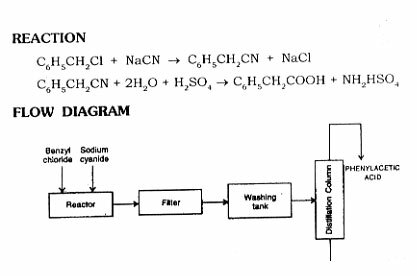 Decompose the solution of calcium salt by addition of potassium sulphate, remove calcium sulphate as a precipitate and obtain potassium salt of G acid in the solution. Take this solution in the mixing tank and add hydrochloric acid, it is further crystallize in a crystallizer. After centrifuging obtain pure G-acid dry in tray drier. Treat the solution coming out of centrifuge with sodium carbonate in a mixing tank. Then crystallize in a crystallize to obtain by-product R-acid (2-naphthol-3, -6-disulphonic acid). Trisulphonate, naphthalene by concentrate sulphuric acid first at 20Â°C, then at 80-85Â°C, finally at 145Â°C. Cool to 85Â°C. Dilute the mixture with concentrate sulphuric acid. Cool to 40Â°C, add 65% oelum 250 Kg. in 8 hours, raise the temperature to 145Â°C and maintain 5 hours. Cool to 60Â°C add extra oleum, raise temperature to 150-155Â°C, maintain for 2 to 3 hours. Cool the mixture to 100Â°C dilute with water 45-50L, and nitrate with mixed acid at 35-40Â°C in 10 hours. 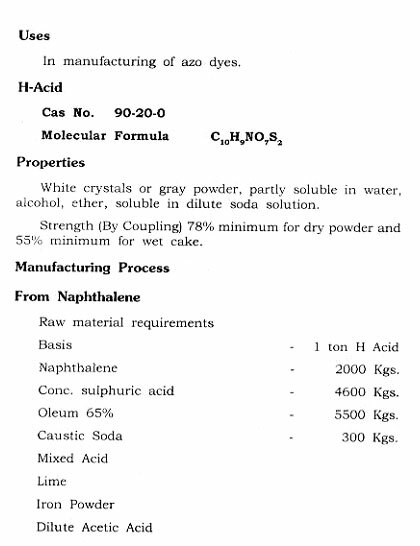 Treat the solution of 1-Nitro, naphthalene 3,6,8-trisulphonic acid with lime (faint acidity) at 80-90Â°C, filter Gypsum, reduce above solution by iron powder any very dilute acetic acid, to Koch acid. Filter the iron sudge precipitate Koch acid as calcium sodium salt by the addition of salt and hydrochloric-acid. After converting to trisodium salt, fuse with caustic soda in an autoclave at 180-185Â°C above 6-8 atm pressure for 6 hours. Cool, filter the mass, acidify, with sulphuric acid to get H-acid. Yield : 50-55% from naphthalene. 85 to 87% from Koch acid. 2 to 3% of l-naphthylamine-6-hydroxy 3,8-disulphonic acid formation during alkali fusion of Koch acid to H-acid has been observed. The above formation can be controlled by controlling the quantity of Koch acid as well as the purity and concentration of caustic soda which must be free from chlorate. 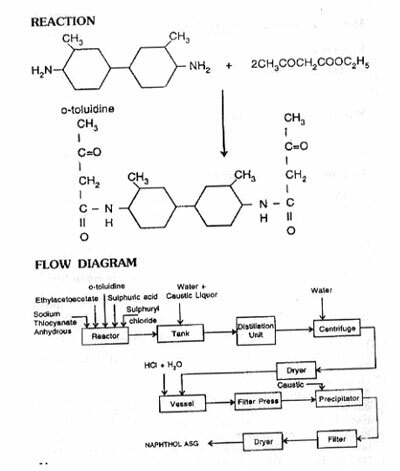 Charge ethylacetoacet and o-toluidine in a glass line kettle. Then add 86% sulphuric acid to form sulphate, cool the suspension to 35Â°C. Add anhydrous sodium thiocyanate, and heat the mixture to 90Â°C for 4 hours and cool. Add sulphuryl chloride and on mixing as reaction proceeds the temperature rises to 75Â°C. Maintain the reaction mass at 75-80Â°C, cool to 30Â°C and run into a tank containing water and caustic liquors. Distill ethylalcohol formed during the reaction. Filter the product, wash and dry. Purify the crude product by dissolving in water and hydrochloric acid at 50Â°C and filter. Make the filtrate alkaline with caustic liquor. Filter the precipitate, wash and dry. The product is pure naphthol ASG. For yellows of good general fastness. The combination are even superior to vat dyes in respect of fastness to kier boiling even under pressure. It is used in manufacturing of Rapid fast yellow GGH, fast yellow GH. Rapidogen yellow G and Rapidogen yellow GS. Rhodamine B is basic red fluorescent dye structurally related to xanthene. It occurs in green crystals or reddish-violet powder. Very soluble in water and alcohol, forming bluish-red fluorescent solution. Slightly soluble in acids or alkalis. The appeal of the basic dyes lies in their brilliant hues, some of them being fluorescent. Unfortunately their brilliance is not matched by their fastness. The light and washing fastness properties of basic dyes are poor. RHODAMINE B is a basic red dye. It occurs in green crystals or reddish-violet powder. Basic 1 ton Rhodamine B. Charge Diethyl-m-aminophenol crystals to a stainless steel kettle, then add phthalic anhydride. Heat the charge and raise to 100Â°C. Add Zinc chloride and heat the charge to 170- 175Â°C and maintain this temperature for 4-5 hours until the melt crystallize. Cool the product and powder in a ball mill. Extract the product with boiling alcohol. Filter the alcoholic solution and cool in a crystalliser. Filter the crystallise .polour base. Dissolve the base in water and hot dilute hydrochloric acid, cool the solution and separate the hydrochloride. Filter and dry the product. (Rhodamine B). It is used as a red dye for paper; for wool and silk where brilliant effects are desired and light fastness is of secondary importance. It is also used as an analytical reagent for certain heavy metals. It is used in the preparation of flakes, i.e. Red 82, and in leather dyeing. It is also used as solvent dye. Industrial gases are considered to be those gases used in their pure form by industry in large quantities. They are used in industry as gases, liquids, or cryogenic liquids. The gases we consider to be industrial gases have been in use for many years. For example, nitrous oxide was used as an anesthetic as early as 1799. By 1608, carbon dioxide had been identified as a specific substance acquired by several means. Some gases for industrial use are produced by means of cryogenics, which is the science and technology of dealing with the behavior of materials at extremely low temperatures. In this chapter three types of gases are discussed : oxidizers, inert gases, and flammable gases. The gases that fall into the category of inert are nitrogen, argon, helium, and carbon dioxide. The oxidizers are oxygen and nitrous oxide. Acetylene, liquefied natural gas (LNG), and hydrogen are the flammable gases. These elements and compounds by no means encompass all gases considered to be industrial gases, but they represent the major gases used and produced in industry. Nitrogen, oxygen, and argon produced for industry arei primarily manufactured by the cryogenic air separation process, in which air is liquefied and separated into its major constituents (oxygen, nitrogen, argon) by the use of cryogenic technology. Table 2 gives the cryogenic boiling point temperatures and concentrations for some of the gases present in the atmosphere. The cryogenic air separation process starts with air entering the plant through air filters, where it is compressed and cooled. The air is passed through heat exchangers for further cooling and for removal of water vapor and carbon dioxide by freezing. Alternatively, a molecular sieve can be used to remove the water and carbon dioxide by adsorption before separation of the air. When the air reaches a temperature of -170Â°C, it is sufficiently free of water and carbon dioxide and ready to be passed into the distillation column. Separation occurs by distillation. The distillation method used is referred to as "double column," as it contains two separate distillation columns operated at two different pressures. The cooled air is fed to the bottom of the high-pressure column. Air is distilled in this column where the higher boiling temperature fluid oxygen stays at the bottom and the lower boiling temperature nitrogen boils to the top as a distillate product. The crude liquid oxygen from the high-pressure column is flashed into the low-pressure column as the two columns are thermally linked by a common reboiler/ condenser. Vapor is withdrawn from the middle of the low-pressure column and is passed as feed to the crude argon column. The vapor in that column is condensed and taken off as liquid crude argon. Pure nitrogen vapor is extracted from the top of the low-pressure distillation column, and liquid oxygen is taken from the bottom of the column. There are other means by which the atmospheric industrial gases can be produced. In addition to cryogenic air separation, there are other, non-cryogenic-based processes, including the membranbe separation process and adsorption processes. The adsorption processes include pressure swing adsorption (PSA) and vacuum swing adsorption (VSA). The membrane separation process is used to produce a number of gases for industrial use. The membrane i"ay consist of a microporous substructure of cellulose acetate and a thin layer of dense cellulose acetate (active layer) on the upper surface, resembling a sponge covered by a plastic film. The membrane is cast into a supporting cloth for added mechanical strength. The active layer serves as the separating barrier and, because of its thinness, provides very high transport rates. The membrane selectively allows the smaller molecular-sized components to pass through the membrane substructure, thereby accomplishing the separation process. The VSA system is a noncryogenic process that makes use of pressure that is less than atmospheric (vacuum) and adsorbents to separate nitrogen, and carbon dioxide from air. 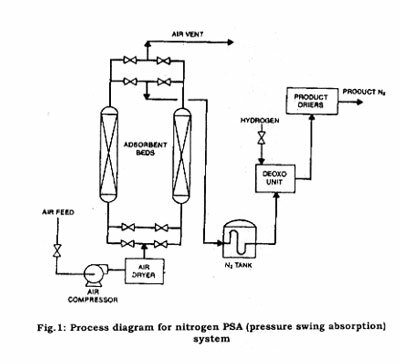 The PSA system is a similar process for producing a particular gas by passing a pressurized gas stream through a set of adsorbent beds. The impurities are selectively adsorbed using a molecular sieve to trap the undesired components. In the production of oxygen using the VSA process, the VSA system separates air at ambient temperature by passing it through a column of adsorbent. 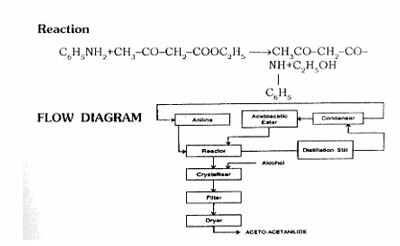 The adsorbent, which is an inorganic crystal material, selectively adsorbs nitrogen molecules on its surface, while the oxygen molecules pass on through the adsorbent column. The final oxygen product exits the adsorber column. The nitrogen adsorbed is released when the adsorber column is reactivated by use of differential pressure from a vacuum. Once the adsorber column is reactivated, 'the cycle is ready to be repeated. In the PSA system, compressed air is passed through a column of chemical adsorbent, which is a carbon-based material that essentially traps the oxygen molecules and allows the nitrogen molecule to pass through to the use point. 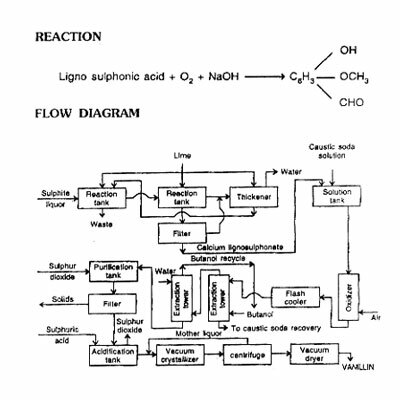 Figure 1 shows the process flow of a PSA system, which can produce 98 to 99.5 percent pure nitrogen without the need of downstream purification. These adsorption systems usually are located at the customer sites. See Fig. 1 for an example of an on-site PSA. Most of the industrial gases are filled in high-pressure gas cylinders for small-volume users. These cylinders then are loaded onto flatbed trucks for delivery. For larger-volume gas transportation, long-length gas cylinders are'permanently mounted on trailer frames. These high-pressure-cylinder vehicles commonly are referred to as tube trailers. The cylinders are constructed of alloy steels, and are designed, built, tested, and maintained in accordance with U.S. Department of Transportation (DOT) regulations. The typical small-volume cylinders are constructed to a DOT 3A or 3AA specification, and typically have rated service pressures from 2015 psig to 2640 psig and water volumes from 0.39 to 1.75 ft3. The larger cylinders often have similar pressure ratings but water volumes of approximately 75 ft3. The containers used for transporting and storing the majority of cryogenic liquids are insulated cryogenic tankers, liquid cylinders, and stationary storage tanks. These containers are similar in design to a thermos bottle. There are an inner vessel, which contains the cryogenic product, and an outer vessel. The space between the two vessels is under a vacuum and usually contains a wrapped insulation material such as aluminized Mylar, or it may contain a powdered insulation such as expanded perlite. The liquid cylinders, usually 160 or 250 liters in capacity, are constructed to a DOT 4L specification and operate with pressures up to 235 psig. The cryogenic tank trucks may be constructed to a DOT MC-338 specification, and range in capacity from 3000 to 14,000 gallons, usually depending on the product. The operating pressures may range from 25 to 150 psig, and the vehicles often are equipped with cryogenic pumps used to deliver the product to higher-pressure storage tanks. The stationary storage tanks are designed and built to ASME standards, typically are constructed for pressure of 250 psig or less, and may range in capacity from 500 to 70,000 gallons. Nitrogen makes up 78 percent of the earth's atmosphere. It is a colorless, tasteless, non-toxic, and inert gas. Nitrogen does not support combustion nor does it support respiration; but it reacts with the more active metals such as lithium and magnesium to form nitrides, and at high temperatures it will combine with hydrogen, oxygen, and other elements. As a cryogenic liquid, nitrogen is nonmagnetic, stable against mechanical shock, and free of toxic or irritant vapor. Nitrogen usually is produced by cryogenic air separation, liquefaction of atmospheric air, and removal of the nitrogen by fractionation, as described earlier. Noncryogenic adsorption technology, including PSA and VSA systems, economically provides nitrogen for requirements between 4000 and 30,000 standard cubic feet per hour (scfh). Nitrogen has many applications, both as a gas and as a liquid. As a gas, nitrogen is employed primarily as a fluid for inerting and pressurizing systems, used, for example, in the following ways: for the agitation of color film solutions in photographic processing and for blanketing of oxygen-sensitive liquids and volatile liquid chemicals; in the production of semiconductor electronic components and for dressing nonferrous metals; in the transportation industry, in pressurizing aircraft tires and emergency bottles to operate landing gear; and often to purge and pressurize pipelines, reactor vessels, or storage tanks throughout the petrochemical industry. Gaseous and liquid nitrogen has applications in the foods industry in the areas of food processing and packaging. Liquid nitrogen is used for rapid freezing of expensive or highly perishable foods, such as shrimp and other meat products, as well as to refrigerate foods in long-distance hauling. A gaseous nitrogen atmosphere can help to retard the spoilage of some food products. Liquid nitrogen is used in the cold-trapping of material such as carbon dioxide from gas streams, as a coolant for electronic equipment, for pulverizing plastics or rubber materials, and for simulating the conditions of outer space. It is used to freeze liquids in pipelines during repairs to the pipeline. Liquid nitrogen frequently is employed in medicine to preserve whole blood, livestock sperm, and other biological specimens. Liquid nitrogen gas is transported in liquid cylinders, nonpressurized dewars, cryogenic tankers, and trailers. Gaseous nitrogen is transported in high-pressure gas cylinders and tube trailers. Both forms of nitrogen also are transported via pipeline when locations relative to sources permit. This substance, which occupies 21 percent of the earth's atmosphere, has a number of very important uses. Oxygen is a colorless, odorless, and tasteless gas that is essential to the support of life. All elements except the inert gases combine directly with oxygen to form oxides. Oxygen is nonflammable, but is an oxidizer that readily supports combustion. A large percentage of the oxygen produced commercially is made by cryogenic air separation. However, this separation is not the only oxygen-producing system; oxygen also may be made by the most common decomposition reaction, electrolysis of water. This reaction produces not only oxygen but hydrogen as well, although it is not usually an economically viable alternative when compared to other technologies. Oxygen's major applications stem from its life-supporting and combustion-supporting properties. It is used extensively in medical applications for therapeutic purposes, for resuscitation in asphyxia, and with other gases in anesthesia. Also it is used in high-altitude flying and deep sea diving, and it is an inhalant and a fuel oxidizer in the U.S. space program. For industrial applications, oxygen is in large demand for use with acetylene, hydrogen, and other fuel gases for purposes such as metal cutting, welding, hardening, and dehydrating. Oxygen enhances the capability of steel and iron furnaces. Oxygen is used in the production of synthesis gas-hydrogn-carbon dioxide mixtures from coal, natural gas, or liquid fuels; the synthesis gases are used to make gasoline, methanol, and ammonia. Oxygen may be used for the cracking of methane or natural gas by partial oxidation to produce acetylene, an important basic chemical. One of the largest commercial applications for oxygen is the Basic Oxygen Furnace (BOF) for refining iron and making steel. Another common application is its use in oxy-fuel burners in the steel industry. It is used in electric arc furnaces, which melt scrap metals by passing an electric current through large graphite electrodes. Oxygen enrichment is a process whereby oxygen is added to an air stream to improve a plant's efficiency. Combustion results in the generation of heat and gaseous by-products, usually carbon monoxide, carbon dioxide, and water vapor. Oxygen enrichment is used in pulp mills to increase lime production from existing equipment and eliminate the need to purchase lime from other industries. It is used again in the pulp mills to reduce airborne sulfur emission to comply with federal environment regulations. Gaseous oxygen is transported in high pressure gas cylinders, tube trailers, and portable cylinder modules. Liquid oxygen is transported as a cryogenic fluid in liquid cylinders and insulated cyogenic tankers. Customer on-site storage is usually accomplished in large insulated cryogenic tanks. A relatively scarce gas, argon is colorless, odorless, tasteless, and nontoxic. It forms no known chemical compound; thus it is extremely inert. Representing only 0.93 percent of the earth's atmosphere, argon is utilized in a variety of applications. In the manufacture of lighting devices, it is used to fill lamp bulbs and to produce colors in display tubes for lighted signs. In the field of electronics, argon provides an inert atmosphere for the production of semiconductors. Some metal welding and cutting applications are required to have an inert gas shield, and argon gas often is used to fill this requirement. Also it is used as a blanket in the productin of many reactive materials, including titanium an zirconium. It is often used to provide a protective shield for the growing of silicon and germanium crystals. Argon is manufactured in oxygen-nitrogen plants by means of fractional distillation after the liquefaction of air as described above, in the cryogenic air separation process. In the distillation process where air is separated into oxygen and nitrogen, a stream of gas is withdrawn from the low-pressure column to enter the crude argon column. The argon content of the gas, initially 10 percent, is increased to 95 percent by subjecting the gas to several stages of distillation. This "crude" argon is further purified to yield the final pure argon product. 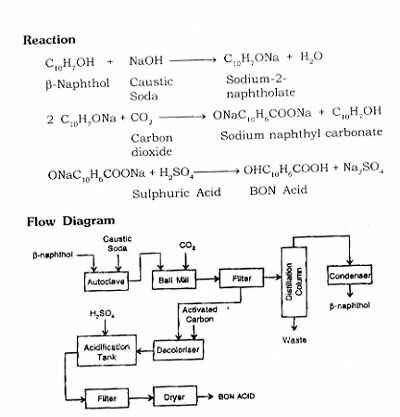 Figure 2 shows a typical air separation process flow diagram. For economic reasons argon often is shipped as a liquid. Liquid argon commonly is transported in liquid cylinders, cryogenic trailers, and portable tanks. Argon can be shipped in high-pressure gas cylinders and high-pressure cylinder trailers. Hydrogen, the lightest element known, is extremely flammable and is found in 0.00005 percent concentration in air. The hydrogen molecule exists in two distinct forms : ortho and para, named according to their types of nuclear spins. Ortho-hydrogen molecules have a parallel spin, and para-hydrogen molecules have an anti-parallel spin. There is no difference in the chemical or transport properties of these forms, but there is a difference in thermodynamic properties. Para-hydrogen is the form preferred for rocket fuels. Hydrogen consists of about three parts ortho and one part para as a gas at room temperature, which is referred to as normal or equilibrium hydrogen. The concentration of the para form increases with decreasing temperature until, for the liquid, the para concentration is nearly 100 percent. If hydrogen should be cooled and liquefied rapidly, the relative three-to-one concentration of ortho to para would not immediately change. Conversion to the para form takes place at a relatively slow rate and is accompanied by the release of heat. For each pound of rapidly cooled liquid hydrogen that changes to the para form, enough heat is liberated to vaporize approximately 1.5 Ib of liquid hydrogen. However, if a catalyst is used in the liquefaction cycle, para-hydrogen can be produced directly without loss from self-generated heat. Hydrogen can be produced by steam methane reformation(the most widely used process) or by off-gas pruification. Hydrogen can be produced at normal purity (95-98%) or at ultra-high purity (99.99%). The first step to obtain purity hydrogen in the steam reformer process when using a natural gas feedstock is to perform a pretreatment. There are small amounts of sulfur in natural gas that must be removed. The sulfur removal is done by preheating the natural gas to 700Â°F, and then sending it through a catalytic reactor. The catalyst inside the reactor absorbs the sulfur. The second step is steam methane reforming. In this procedure, natural gas and steam are sent through a set of reformer tubes which are packed with a reforming catalyst. The reaction is heated by a furnace inside the reformer. The methane and steam react, and the results are 45 percent hydrogen, 40 percent steam, 8 percent carbon monoxide, and 7 percent carbon dioxide. The third step to obtain normal purity hydrogen is gas shifting Carbon monoxide, hydrogen, and steam are sent through a shift converter where the gas is heated between 400Â°F and 700Â°F. The carbon monoxide and steam react to yield hydrogen and carbon dioxide. To produce pure hydrogen, the carbon dioxide must be removed. The gas passes through a carbon dioxide removal system, which contains a chemical solvent that goes through the gas and selectively absorbs the carbon dioxide. Heat then is added to the solvent to discharge the carbon dioxide. The regenerated solvent is returned to the system to continue the removal of carbon dioxide. To obtain ultra-pure hydrogen, the pressure swing adsorption (PSA) system is considered. In this process, hydrogen, steam, and carbon dioxide are introduced to the system. At high pressure, the gas is passed through an adsorbent bed, and the adsorbent picks up the impurities and allows hydrogen to pass through the bed. In the regeneration process, the pressure is lowered to purge out impurities. Then the hydrogen is used to rinse the adsorbent and repressurize the vessel. The efficiency of the hydrogen purification system is optimized at an operating pressure that allows use of a catalyst tube in the reformer. There are four other distinct processes by which hydrogen may be produced under the off-gas purification method: pressure swing adsorption (PSA), membrane separation, catalytic purification, and cryogenic separation. The cryogenic separation process uses cryogenic principles to condense and separate the impurities from hydrogen. Impure hydrogen is introduced to the cryogenic system or "cold box." The impurities are factored out, and pure hydrogen is obtained. Membrane separation makes use of two layers of membrane material; the first layer is nonporous, and the second layer is porous. A gas mixture under increased pressure is subjected to the surface, which allows a smaller molecule such as hydrogen to permeate faster than a larger molecule such as carbondioxide. Some other sources for hydrogen are the dissociation of ammonia, steam reforming of light hydrocarbons, and byproduct streams of chemical and petroleum processing. The "steam iron" process is another method used to make hydrogen. Passing steam over heated, spongy iron reduces the steam to hydrogen with additional formation of iron oxide. There are several varieties of this process. The water-gas reaction is a reaction of steam with incandescent coke or coal; it is a. source of hydrogen with carbon monoxide as an additional product. In the catalytic version of this reaction, excess steam breaks down to form more hydrogen while oxidizing the carbon monoxide to form carbon dioxide. Hydrogen frequently is obtained as a by-product of cracking operations using petroleum liquids or vapors as feedstock. Also hydrogen may be produced through the electrolysis of water. There are many applications for hydrogen. It is used to make fertilizers, as the active ingredient in detergents, and in the manufacture of polyurethanes. It finds application in the production of semiconductor devices, in the process of refining crude oil, in food processing for edible oils and shortening, and as fuel for the space shuttle. The hydrogenation of edible oils in soybeans, fish, cottonseed, and corn produces solids used in shortening and other foods. Many alcohols also are produced by the hydrogenation of the corresponding acids and aldehydes. 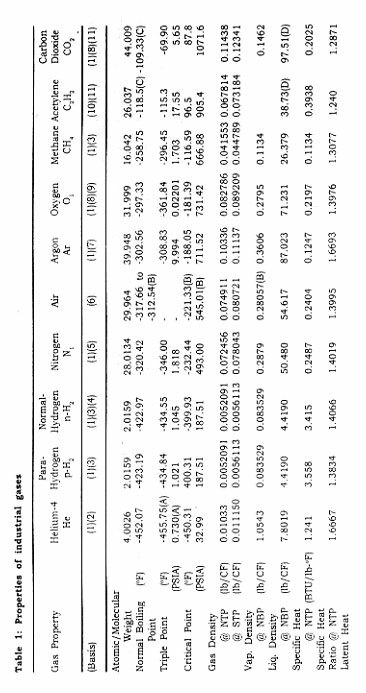 It is possible to use hydrogen in low concentrations as a physiologically inert gas for a breathing atmosphere where multiple gases are involved. In the metals industry, hydrogen is used for applications such as annealing metals, it is also used as a fuel in underwater oxyhydrogen torches and with oxy-hydrogen welding and cutting systems. Hydrogen serves as a nonoxidizing shield alone or with other gases in furnace brazing and in welding aluminium, magnesium, and lead. The temperature in the oxy-hydrogen flames is about 4000Â°F which is suitable for low-temperature welding and brazing. It also is used in underwater cutting. Oxy-hydrogen flames are used in the fabrication of quartz and glass. Atomic hydrogen welding is suitable for very thin stock and can be used with practically all nonferrous alloyws. In the process, an arc with a temperature of about 11,000Â°F is maintained between two nonconsumable metal electrodes. Molecular hydrogen fed into the arc is transformed into atomic hydrogen, which sends heat from the arc to the weld zone. At the surface of the welding area, the atomic hydrogen recombines to molecular hydrogen, with the release of heat. Liquid hydrogen is very important as a fuel for powering missiles and rockets. It is used in laboratory research on the properties of some materials at cryogenic temperatures, work often associated with studies of superconductivity. Liquid hydrogen can be used as a fuel, for either propulsion or heating. Hydrogen gas is shipped in high-pressure gas cylinders and high-pressure cylinder trailers. Liquid hydrogen is shipped in insulated portable containers, and in cryogenic tankers. The normal liquid hydrogen supply system utilizes a cryogenic stationary storage tank rated at 150 psig, just below the critical pressure of hydrogen. A cryogenic pumping station, which has a liquid hydrogen storage tank, a high-pressure cryogenic pump capable of supplying liquid hydrogen at 3000 psig, and high-pressure gas storage tubes, often is used to supply large quantities at pressures above 150 psig. Helium was discovered during an eclipse as an orange line in the spectrum of the sun's atmosphere. Physically, helium is colorless, odorless, and tasteless; and it is the second lightest element, second only to hydrogen. Helium is chemically inert and has only a 5 ppm concentration in the atmosphere. One of helium's first uses was as a non-flammable replacement for hydrogen for inflation of lighter-than-air aircraft. Today liquid helium is vitally important in cryogenic research, as it is the only known substance- Ito remam"fluid at temperatures near absolute zero. It has a unique use as a refrigerant in cryogenics and is the only nuclear reactor coolant that does not become radioactive. Liquid helium is used extensively with super-conducting magnets; in the medical field, it is used to cool the superconducting magnets for magnetic resonance imaging (MRI). Helium has a variety of other uses in welding and lighting. It is used as an inert gas shield in arc welding, for filling cold weather fluorescent lamps, and to trace leaks in refrigeration and other closed systems. Also helium is used for specialized purging and pressurizing applications. Helium can be used in place of or together with nitrogen as the inert portion of the atmosphere in sealed environments such as space vehicles, deep-sea submergence vehicles, and diving suits. The use of helium in a plasma arc furnace, is becoming an increasingly popular method for melting precious metal ores and scrap. Small amounts of helium are extracted from the atmosphere by fractionation methods, but not commercially because of the small amount of helium in the atmosphere. A number of natural gas wells contain helium, which can be recovered by a liquefaction and stripping process. Natural gas containing at least 0.2 percent helium. Helium cannot be synthesized; so conservation and cleanup recycle systems for "spent" gas are important means of preserving the earth's helium resources. Gaseous helium is stored and transported in high-pressure gas cylinders, high-pressure gas trailers, and portable cylinder modules. Liquid helium is transported in liquid cylinders, portable tanks, and cryogenic tankers. Because of the extremely low temperature of liquid helium and the cost to produce it, special design considerations must be given to storage containers in order to maintain the helium in the liquid phase. Some containers are designed to include a sacrificial liquid nitrogen shield that intercepts heat before it is transferred into the liquid helium. The carbon dioxide market in the United States is served by both gaseous and liquid/solid carbon dioxide. The consumption of CO2 gas is approximately 22 million tons per year with the enhanced oil recovery and urea production markets being the primary consumers. Liquid and solid consumption is about 5 million tons per year serving primarily the food and beverage processing industries. Carbon dioxide is used extensively in a variety of areas. It is used for pressurizing, and as a source of bubbles and the acidic taste in soft drinks. Carbon dioxide is used to fill a type of fire extinguisher that literally depends on the inertness of the compound. Carbon dioxide is also used in freezing specialty and quality foods. More specifically, each physical phase of carbon dioxide has uses in many areas. Gaseous carbon dioxide is used for the pH control in water treatment and as a growth stimulant for plant life. Liquid carbon dioxide is used in one case as an expendable refrigerant for low-temperature testing of aviation, missiles, and electronic components. It is also used in controlling chemical reactions and for stimulation of oil and gas wells. Solid carbon dioxide, commonly called "dry ice," is used extensively as a refrigerant for dairy products, meat products, and other frozen foods while in transit. It is also used as a cooling agent in many industrial processes such as grinding heat-sensitive materials, cold-treating metals, shrink fitting machinery parts-,-in j/acuum cold traps, in cryo-surgery, and specimen preservation and storage. Carbon dioxide is usually nonreactive and nontoxic. At normal atmospheric pressure and temperature, it is colorless and odorless. Carbon dioxide will not burn, nor will it support combustion. Unrefined carbon dioxide gas is typically obtained from the combustion reaction of coal, coke, natural gas, and other carboniferous fuels. The gas obtained from the combustion process is liquefied and purified by several different processes to a purity of about 99.9 percent. The major source of carbon dioxide is as a by-product of steam-methane reforming. The resulting reformer syngas may utilize one of the following three processes in the production of carbon dioxide. Carbon dioxide may be manufactured at 95 percent purity by the membrane separation process from a similar gas or from natural gas. In the recovery of high purity carbon dioxide from the syngas or natural gas, and before any separations ca*n occur, *a pretreatment step removes any contaminants and any condensate liquids that may be present. The feed gas then enters the membrane system at 300 to 1000 psig. The permeate gas is delivered at pressures between 50 to 150 psig and at a carbon dioxide purity of about 95 percent. The high pressure residual gas containing 10 to 30 percent carbon dioxide enters a conventional treatment process such as monoethanolamine or diethanolamine for a final cleanup. The carbon dioxide off-gas from the conventional treatment process is then elevated to the same pressure as that of the permeate gas from the membrane system. The combined streams may be further compressed to higher pressures, such as 2000 psig for applications in carbon dioxide flooding in enhanced oil recovery. A second process used in the production of carbon dioxide is pressure swing adsorption. The feed gas usually contains approximately 20 percent carbon dioxide, 70 percent hydrogen, and the remainder methane, carbon monoxide, nitrogen, and water. The feed gas is typically under a pressure of 125 psig to 400 psig at temperatures of 80 to 120 degrees Fahrenheit. The carbon dioxide and water are strongly adsorbed in the absorb beds and the residual gas stream is depressurized for further recovery. The absorber vessel is then evacuated through vacuum blowers where the carbon dioxide, which has been adsorbed by the bed, is relased at purities essentially 99+% pure. 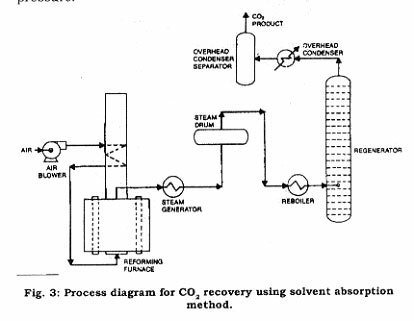 Recovery of pure carbon dioxide from reformer syngas has often been accomplished through absorption by liquid solvents. The solvents used are : monoethanolamine (MEA), diethanolamine (DEA), and methyldiethanolamine (MDEA). See Fig. 3 for the process flow diagram. In this process, the syngas stream from the reformer is sent to the stripper column where the carbon dioxide is absorbed by the solvent. The residual gas stream components are discharged from the stripper column. The carbon dioxide in solvent is sent to the regeneration column where the carbon dioxide is regenerated and discharged for further purification by compression dehydration and refrigeration steps. The solvent is returned to the stripper column. The final product is essentially 99.9 percent pure. Liquid carbon dioxide is transported in high pressure gas cylinders or liquid cylinders, and in foam insulated tank trucks. Solid carbon dioxide is packaged in various blocks wrapped in heavy paper or heavy insulated bags. Liquid carbon dioxide is normally stored in a foam insulated tank that has a refrigeration unit to maintain the tanks temperature and pressure. The advantages of liquefied natural gas (LNG) are evident in that over 600 standard cubic feet of natural gas occupy only one cubic foot of space in its liquid form at -260Â°F and atmospheric pressure. This significant volume reduction reduces the storage and transport volume, and allows shipment of natural gas in areas where pipelines were never feasible. The primary vehicle for transporting LNG is the cryogenic tanker. It also is transported in specially designed ships. LNG is composed predominantly of methane, which may contain minor quantities of ethane, propane, nitrogen, helium, and other components normally found in natural gas. In the past the liquefaction of natural gas used a classic cascade cycle. The process required 120,000 horsepower for liquefaction of over 150 million standard cubic feet per day. Provisions are made for some of these cycles to use seawater for cooling. 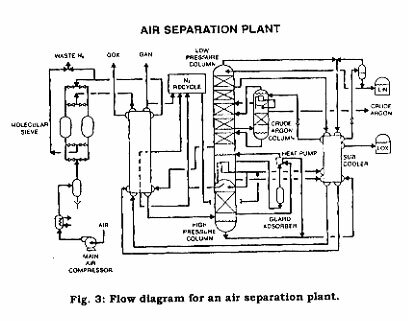 Later, baseload LNG plants utilized mixed refrigerant cycles, such as Air Products and Chemicals, Inc.'s propane precooled mixed refrigerant system. Baseload plant capacities range from about 70 mmscf/day to about 350 mmscf/day of LNG. Baseload plants move LNG from remote sites by ship to populated areas. For example, Indonesia supplies LNG to Japan for electric power generation. At baseload LNG production plants, natural gas enters the plant at near 85Â°F and 600 psig. The gas is treated to remove carbon dioxide and any sulfur compounds, and it is cooled with high-level propane refrigerant to remove as much water as possible. Dehydration to a dew point of about-100Â°F is done by carrying out regeneration with dried outlet gas by way of a high-pressure steam heater and a regeneration gas compressor. The dry, treated gas is passed through a stationary bed of activated carbon for removal of mercury, and is cooled with two successively lower levels of propane refrigeration. A scrub column makes a rough fractionation to remove the heavier and medium carbon compounds. The gas at the bottom of the scrub column flows to a fractionation train, which consists of a deethanizer, a depropanizer, and a deubtanizer where relatively pure ethane and propane are produced. Excess ethane, propane, and butane from the fractionation process are reinjected into the main gas stream just prior to liquefaction. The overhead from the scrub column flows to the main heat exchanger for liquefaction to LNG. Figure 4 shows the process flow for a LNG plant. For years LNG has been used for peak-shaving purposes, which is the storage of excess capacity of liquid natural gas to be revaporized for the coldest days of the year. In recent years LNG has been used in heating and vehicle propulsion. Also LNG is used to produce carbon black, which has applications in the manufacture of rubber products and printing ink. The burning of high-purity LNG (methane) is done to make carbon black for particular use in electronic devices. Acetylene (C2H2) is a colorless and flammable gas. At 100 percent purity, acetylene is odorless, but at commercial purity it has a garliclike odor. Acetylene can be liquefied and solidified with ease, although in both cases it explodes with extreme violent when ignited. Acetylene can be inhaled in rather high concentrations without chronic, harmful effects. In fact, it has been used as an anesthetic. However, it is a simple asphyxiant if present in concentrations high enough to deprive the lungs of oxygen and produce suffocation. Acetylene also is manufactured by thermal or arc cracking of hydrocarbons and by a process utilizing the partial combustion of methane with oxygen. The acetylene produced from calcium carbide is basically pure, with only water and air as impurities. Eighty percent of the acetylene produced is used for chemical synthesis. Acetylene is an important raw material for a series of organic compounds such as acetaldehyde, acetic acid, acetic anhydride, acetone, and vinyl chloride. Those compounds are used to manufacture a large group of products, including plastics, synthetic rubber, dyestuffs, solvents, and pharmaceuticals, and in the manufacture of carbon black. The other 20 percent is used for oxy-acetylene welding, cutting, heat treating, lighting puposes, buoys and beacons. In the primary method for producing acetylene, calcium carbide is fed into a generator containing water. The resulting wet acetylene gas at 120Â°F to 140Â°F is piped to a cooler condenser where it is cooled to 80Â°F to 90Â°F and the water vapor is condensed. This is the first step in the drying process. The gas then goes to a low-pressure dryer filled with calcium chloride. The calcium chloride absorbs the moisture from the acetylene gas, which then enters a compressor, where the pressure is increased to 200 to 375 psig. An oil separator filters out excess impurities and oil. The gas next goes to a high-pressure dryer, where all remaining water is removed. The gas is then pumped into cylinders for shipment. The byproduct calcium hydroxide is sent to a storage tank, where water is decanted off the top, and is recovered. The only method of distributing acetylene other than pipeline, is by means of portable steel tanks containing a porous solid filler saturated with acetone or other suitable solvent, in which the acetylene is dissolved under pressure. Acetylene alone is not handled at pressures higher than two atmospheres because of its tendency to decompose explosively dissolved in acetone it may be stored at pressures of 10 to 15 atmospheres. Nitrous oxide (N2O), commonly known as laughing gas, is a colorless and practically odorless, tasteless, nontoxic gas. Nitrous oxide is an oxidizer that will support combustion, but it is a nonflammable gas. It is water-soluble; but when it is dissolved, its acidity does not change. The impurities formed are mostly high oxides of nitrogen and are highly toxic. After the water is removed in a condenser, the gas is washed in a solution of potassium dichromate to remove nitric oxide, in caustic to remove nitric acid, and finally in water. Nitrous oxide is an inhalant type of anesthetic or analgesic gas. It serves as a propellant for various aerosol products, particularly with foods such as whipped cream; and it is used as an oxidizing agent in blow-torches and as a chemical reagent in the manufacture of various compounds, both organic and inorganic. It also serves as an ingredient in rocket fuel and high performance vehicle formulations, and it is used as part of the working fluid in hypersonic wind tunnels that have been investigated recently. Nitrous oxide is filled and transported in its liquid phase in high-pressure gas cylinders or in liquid cylinders. It is transported as a liquefied compressed gas under high pressure in cylinders and at lower pressures and reduced temperatures in refrigerated cargo tanks and insulated portable tanks. Nitrous oxide is stored in a foam-insulated tank accompanied by a refrigeration unit, which is similar to the tank used for carbon dioxide. Solubility Practically insoluble in water; miscible with alcohol, ether. Benzyl acetate is manufactured by the action sodium acetate on benzyl chloride in the presence of catalyst pyridine. Benzyl chloride is obtained by the action of chlorine on toluene in the presence of light. Basis 1 ton benzyl acetate. Charge toluene to spherical glass reactor. Heat toluene to 80Â°C, and bubble chlorine into toluene. It is a exothermic reaction, temperature will go to 110Â°C. Maintain 110Â°C throughout reaction. Product of chlorinated toluene contains 50% toluene, 45% benzyl chloride and 5% of higher boiling product such as benzal chloride, benzo trichloride. The density of this mixture is 0.98. Higher density indicates more high boiling products. The vent gases from the reactor contains benzyl chloride, benzal chloride and HCI gas. Charge reacted material to the distillation still and distill under vacuum. Condense the vapour coming out the still and the distillate is mostly toluene. Collect under vacuum benzyl chloride and higher boiling products remain in the still. Charge Benzyl chloride to a spherical glass reactor. Add sodium acetate with pyridine, heat the reactor contents upto 150Â°C, under pressure for 10 to 12 hrs. After completion of reaction, treat the product with sulphuric acid and precipitate pyridine and sodium chloride by preferential precipitation. Filter the precipitate and take filtrate to distillation still. Carry out distillation under vacuum and collect unreacted benzyl chloride and benzyl acetate. Charge salicylaldehyde, acetic anhydride and sodium acetate in a stainless-steel reactor and boil the mixture for few hours. Add water with sodium carbonate to the reaction mass which generates carbon dioxide. Scrub the gas, cool the mass and filter the product through filter ^]fess: Dry the product coumarin at 100Â°C. Recover sodium acetate from the filtrate. Poison by ingestion, intraperitoneal, and subcutaneous routes. Physical Form Leaflets on distillation in vacuo; plates, tablets from petroleum ether. Solubility Slightly soluble in cold water, freely in hot water. Soluble in ether, chloroform, carbon tetrachloride etc. Ben2yl chloride is converted into benzyl cyanide first and then it is treated with sulphuric acid to get phenylacetic acid. Basis 1 ton phenylacetic acid. Sodium cyanide(97 to 98%) 725 Kg. Take water and sodium cyanide to a reactor under stirring and heat to make solution. Add solution- t]f benzyl "chloride in 95% alcohol in one hour. Heat the mixture under reflux for 4 to 5 hours. Cool the mixture and filter in vacuum filter to remove sodium chloride. Distill the liquid and remove alcohol. Cool the residual liquid and separate the layer of benzylcyanide. Distill benzylcyanide under reduce pressure and collect at 115 to 120Â°C at 10 mm. The yield is about 90 to 95%. Treat this benzyl cyanide with sulphuric acid and get phenylacetic acid. Obtain pure phenylacetic acid. Obtain pure phenylacetic acid by distillation at 176-190Â°C at 50 m.m. and allow to solidify. (M.P. of pure phenylacetic acid - 76-77Â°C). Starting material in manufacture synthetic perfumes, condensation products with aldehydes, medicine and manufacture of penicillin plant hormones. Moderately toxic by ingestion, subcutaneous and intraperitoneal routes. When heated to decomposition it emits acrid smoke and irritating fumes. Physical Form White or very slightly yellow needless. Pleasant aromatic vanilla odour and taste. Slowly oxidizes some what on exposure to moist air. Affected by light. Solubility Soluble in 125 parts water, 20 parts glycerol, 2 parts 95% alcohol, chloroform and ether. Vanillin is the important synthetic flavoring materials in terms of the quantity used. The other flavouring material are methyl salicylate (winter-green) and terpineol. Vanillin is obtained by the alkaline oxidation of lignin-containing substances such as waste sulphite pulp liquor. The much lower cost of lignin vanillin will be largely responsible even though a few users still prefer vanillin made form eugenol. Synthetic vanillin must compete, with natural vanilla extracted from the vanilla bean. Lignin vanillin plants are so closely integrated with paper mills. Sodium hydroxide(without recovery) 2000 Kg. Butanol (make up) 100 Kg. Treat waste sulphite liquor containing about 15 per cent lignosulphonic acid with lime in series of three tanks. In the first stage at pH 10.5, precipitate calcium sulphate. Remove calcium sulphate precipitate by draining the solution to second tank. In the second, increase pH to 12.0 to precipitate calcium lignosulphate. In the third tank, add more lime. Reuse this thick slurry type mass as a supplementary lime source in the first tank. Filter the precipitated calcium lignosulphonate from the second tank under vacuum and redissolve in a caustic solution, prepare the solution in such a way that caustic is 10% and lignin solid is 3.5%. This solution is such that it gives maximum yield of vanillin. Pump this solution to falling film counter-current contactor in which the controlled flow of air oxidizes the sodium lignosulphonate to sodium vanilliate. Carry out this oxidation reaction in an autoclave at 220Â°C to 230Â°C. The residence time of the liquid in the contactor is around 4 to 5 minutes. Conversion is about 17 to 20%. Reaction is exothermic so keep the temperature between 220Â°C to 230Â°C to avoid over-oxidation. Release the pressure slowly and extract vanillate with butanol, give two to three washes of butanol to get maximum extraction. Treat the vanillate solution further with sulphur dioxide, to remove the undesirable phenolic material from the vanillate. Precipitate the phenolic materials, filter under vacuum, transfer pure vanillate solution to an acidifier for acid treatment and release the sulphur dioxide. Recover vanilline by vacuum crystallisation, centrifuge and vacuum tray drying. Yield: about 15% based on dry lignin solids. Eugenol, obtained from oil of cloves, is converted to isoeugenol by heating with an alkali. The latter is then oxidized to yield vanillin. 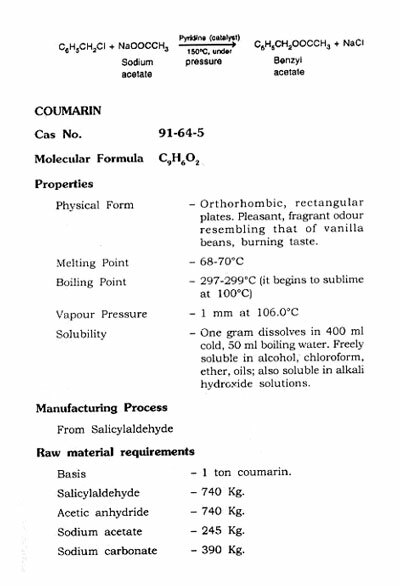 Vanillin has been produced from safrole, (obtained from camphor oil) by treatment with alkali to give isosafrole. After conversion to protocatechuic aldehyde, methylation gives vanillin. The use of technical grade vanillin as an intermediate in the production of pharmaceuticals has surpassed its application in perfumes and as a flavoring agent in foods. The manufacture of drugs such as Aldoment and L-dopa. Both U.S.P. FCC grades must contain not less than 97% vanillin. The U.S.P. grade should not lose more than 1% and FCC grade not more than 0.5% of its weight on drying for 4 hrs. The technical grade contains foreign odours and colour. Moderately toxic by ingestion, intraperitoneal subcutaneous and intravenous routes. However, it can cause irritation on skin and mucous membranes. Zinc sulphate, also known as white vitriol find a wide variety of uses in chemical and allied industries North-West part of Indian has many zinc sulphate consumer industries. Colourless crystal, small needles or granular crystalline powder without odour. Sp.gr. 1.957 (24/4Â°C), m.p. 100Â°C. Soluble in water and glycerol, insoluble in alcohol. Precipitating agent for viscose rayon, trace nutrient in animal feeds, fertilizer ingredient, fungicide, oil floatation, water purification, galvanizing of iron products. A study of the production and consumption pattern indicates that there is substantial demand of zinc sulphate in the country. Considerable amount of zinc sulphate required by various industrial applications is of high purity and analytical reagent grade (A.R. grade). Very few of the zinc sulphate manufacturers are engaged in the manufacture of A.R. grade zinc sulphate. With the recent revolution in modern agricultural cultivation the use of technical grade zinc sulphate is bound to increase tremendously in the near future. Purified technical grade zinc sulphate is manufactured by zinc ash with dilute sulphuric acid. Metallic impurities like Pb, Cd, Cu, Ni, Co, Al. When zinc ash is reacted with sulphuric acid in a lead lined reactor, metallic impurities like Fe, Cd, Al, Ni etc. are also dissolved in the acid while other insoluble impurities remain in the form of a sludge. From the mixer reactor, the zinc sulphate slurry along with impurities and insoluble sludge is then transferred to another jacketed reactor and reacted with dilute sulphuric acid and heated by steam to achieve maximum possible conversion of zinc content and zinc ash into zinc sulphate. After the completion of reaction, the slurry is pumped to a settling tank equipped with an agitator. The sludge is removed from the bottom and the clear slurry of zinc sulphate solutions is transferred to a purifying tank in which iron impurities are removed by the addition of KMnO4 and the slurry is filtered in a wooden filter press. Finally zinc sulphate solution is sent to the settler tanks equipped with an agitator and a pH meter. In this vessel ZnCO3 is added to the ZnSO4 solutions containing residual sulphuric acid. Carbon dioxide formed escapes out of the tank while ZnCO3 itself is recovered as zinc sulphate. During the addition of zinc carbonate, pH of the solutions is carefully noted till the pH meter indicates no acid in the solution (i.e., pH is observed as 7). The solution (containing no acid and impurities removed in various stages) is fed to an evaporator open pan type with mild steel steam jacketed. The dilute solution of purified ZnSO4 is concentrated to a viscose solution which is cooled in a cooler. Cooling of hot concentrated ZnSO4 solution result in crystallization of ZnSO4.7H2O salt. This slurry containing ZnSO4.7H2O crystals is fed to a stainless steel centrifuge to separate the crystals from mother liquor which is recycled to the evaporator. Crystals of ZnSO4.7H2O formed are redissolved in distilled water and dilute solution again recycled as washings in the centrifuge. The washed crystals are then dried in trays in a tray dryer and the dried product is packed for marketing. Zinc sulphate solution after filtration is taken into a series of purification tanks where the solution is treated with various chemicals to precipitate the impurities which are originally soluble in the first solution. Iron impurities are removed by the addition of KMnO4 and filtering the slurry in a wooden filter press. The solution after removal of impurities or if purification is not desired as obtained after filtration is concentrated in an open tank of mild steel construction with lead lining on direct firq. The fire is kept much below the bottom of the tank to avoid any breakage of lead lining resulting from excess heating. The liquid is concentrated to the desired extent and cooled. The crystals produced on cooling are hand picked with nylon cloth and placed in a dryer for drying. It is finally packed in polythene lined jute bags or sealed drums. If purifications is carried out the crystals obtained should be further dissolved in water and recrystallized. Disodium Ethylenediamine Tetra-Acetate (EDTA) Solution-0.05 molar. Standard Zinc Solution-Weigh 1.250 g. of reagent grade zinc metal, dissolve in 20 ml. of hydrochloric acid (1:1) and make up to 500 ml. in a volumetric flask. Formaldehyde Solution-Dilute 1 volume of formaldehyde (36 percent w/v) with 8 volumes of water. Dissolve 0.5 g. of the material, accurately weighed in about 25 ml. of water and add 0.1 g. of ammonium chloride and 0.5 g of sodium cyanide. Add more cyanide if the precipitate formed does not dissolve completely. Add approximately 75 ml. of water and 10 to 20 ml. of ammonium hydroxide. Add sufficient amount of Erichrome Blank T indicator to produce a red colour (only a few specks are required) and stir until dissolved. Add 20 ml. of formaldehyde solution and titrate with EDTA solution to a clear blue end point. It is important to carry out titration immediately after addition of formaldehyde solution. Pipette 50 ml. of standard zinc solution into a 600 ml. beaker. Add ammonium hydroxide until a permanent precipitation is formed, followed by 10 ml. more of the alkali. Dilute to 300 ml. and add few specks of the indicator. Titrate the red solution with EDTA solution to a clear blue end point. V2 = Volume in ml. of EDTA solution used with the standard zinc. W = Weight in g of the material taken for the test.